Last week, the 4th cohort of NYC Civic Innovation Fellows experienced their first bootcamp training at the Manhattan Borough President’s Office. The training consisted in a well-explained lecture by Noel Hidalgo, in which he disclosed a broad amount of information regarding NYC.gov structure, Community Boards, Community Technology, and 311, they were also given a brief overview of how local government functions and about the designated functions of particular government entities and their responsibilities. The second part of this training was an extensive questionnaire where the fellows had to make comprehensive research about the concepts taught in the lecture. 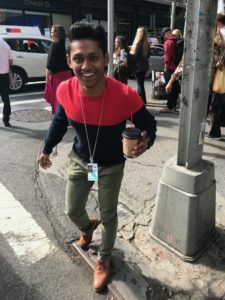 The trainees were assigned one Manhattan Community Board and were challenged to explore it by walking around while filing 311 service requests. Nazija (CB 04): The lab encouraged me to think about the important role communication has in our communities, and how technology has made it so that we can all communicate efficiently, if we use it correctly. First we were asked to think of some form of technology that people in our communities use frequently. Then we were asked to contemplate who owned it, who had the most access and who had the least, as well as how this technology could facilitate better communication between community boards and people. Mina stepping across a broken sidewalk. Mina (CB 07): I had to look for technology we share in our community, and research it in depth. I choose the NYC Wi-Fi pole. It’s great technology, connecting a whole city with the internet. It brought to my attention that it won’t be only in NYC but it will exist around major cities around the world. The technology would bring billions of dollars to other cities and provide employment. On top of that, it’s free for the public. It provides millions of people with access to the internet and helps the city with the built-in 311 service app. Also, let’s not forget that was simple idea of turning payphones into a Wi-Fi hubs. Sonia (CB 2): Prior to this internship, I never really thought about community technology. It is pretty cool that before Google Maps, public technology had already developed mapping sites. I did not think that public or community technology could be progressive or effective. I am normally the type that would grumble to myself about a problem in the neighborhood. However with community technology, I can participate to make my community better by pinpointing or addressing my community issues to the local government. Shovan stepping into a broken sidewalk. Shovan (Queens CB 12): I focused on LinkNYC as my community technology. Link NYC, a project created to help the public with making free phone calls (including emergency calls) and providing free WI-FI service and device charging. I picked this technology because it is fairly a new technology introduced to NYC. My favorite part of LinkNYC is its ability to serve many functions at the same time. I think it was an expensive project to build a kiosk like this. Its touch screen function allows navigation to seek services easily. I am a fan of this technology because I have seen this kiosk being tremendously helpful for those who needed to charge their phones and make emergency calls. Regarding your experiences making the 311 Service requests in your community board. Karina (CB 01): I may have underestimated 311. I did not think they would have responded so quick to my service requests. Maybe that was the case before technology was not as big as it is today. I prefer using the app. It is super convenient. 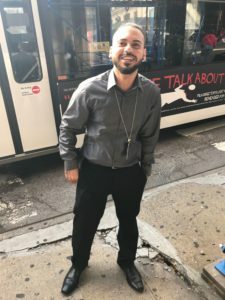 Federico (CB 08): My 311 service request experience was interesting, paying more attention to the issues, I could see the difference between different neighborhoods, for example, around Flushing, in Queens, I found a lot of broken sidewalks or curbs, near the Main Street Station, even though there were some problems with the sidewalks, I found even more graffiti on different buildings. After that, I went to my community board, which is number 8, that includes Upper East Side and Roosevelt Island, it was harder for me to find. I had to walk a lot since the streets were well-cleaned, fixed when they had problems and there were no graffiti on the walls. I ended up finding a couple of broken sidewalks close to the most crowded places like Hunter College and close to the MET. When I checked through my requests, I could see that I got all my request number IDs for the Queens requests but not for the Manhattan ones. Lili (CB 05): The second portion of the lab required me to a bit of online research and physical travel around the city. The task was to do online research on the history of 311. Afterwards, I had to become familiar with NYC 311 services by documenting a number of service requests through different platforms. In order to file service requests on the NYC 311 website and app, I needed to observe what areas of in my community board needed improvement. I canvassed the Midtown area, and surprisingly my experience was challenging. It was hard to find things to file about, mostly because the midtown is a well-maintained, central business district composed of skyscrapers, hotels, offices and retail establishments. On the upside, it is a good sign that NYC is thoroughly efficient in providing government services to the Midtown neighborhood. Once I went to residential area of lower Manhattan, I found more issues to document. I also thought that the mobile app was easy to use and navigate through. Unfortunately, it was slow in loading. It could be improved upon, seeing as there were some data that I could not submit to NYC 311. For example, abandoned bikes and flooding complaints are omitted from the list of service requests. It takes further research to be able make these types of complaints. This raises the question of whether or not would the average citizen dig so much into the 311 website just to file a complaint? The point is that the process of filing complaints should be a seamless experience. The platforms, such as the 311 website and app, should be easy to navigate through. Ramesh (CB 10): I paid particular attention of the specific challenges and biases in my reporting. For example: I reluctantly reported a vehicle illegally parked on a hydrant, and I remained concerned that someone would get an expensive ticket on a slow day. In another service request, I reported a bike chained to a tree. The bike seemed to be used for food delivery from the restaurant immediately in front of the tree. I could immediately imagine the restaurant worker or owner complaining about the sense of municipal micro-management or overzealous complaining. Another issue I grappled with was graffiti. If I felt that some graffiti were characteristic of the neighborhood, such as large murals of historic musicians, I did not report this as graffiti. I was also conflicted on whether or not this artwork was legal; I thought it was possible that such a large work might be publicly sanctioned; however, I acknowledged that subjective bias in determining what was graffiti and what was art. The idea of learning how the system works and using data to improve the efficiency and quality-of-life for the district became my guiding principle in overcoming these minor setbacks in my reporting.